As I was pawing through the stack of autographs I got back in 1992/3, I was disappointed to see that I didn’t get one from Steve. When I flipped the card over later by accident, I noticed the autograph on the back scrawled in ball point pen. Despite this, I was still happy to add “The Machine” to my collection. Steve Emtman is difficult to peg, but it’s hard for me to have labeled him a bust. He does qualify certainly as cursed though. I think most teams would have taken him if presented the opportunity. 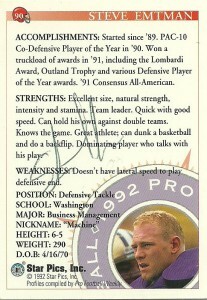 He played far and away at a level above most other college linemen at Washington and won numerous accolades to back it up. All signs pointed up for The Machine as the Colts named him their number one pick. As the new season dawned Emtman flashed some potential right out of the gate, making his first sack against Cleveland in a 14-3 win. Perhaps in his finest highlight moment, he picked off a Dan Marino pass and returned it 90 yards for a touchdown in a 31-20 win and make another sack, but week 9, blew out his knee- ending his 1992 season on injured reserve. His 1993 would start out just as promising. After 5 games he had a sack and 22 tackles, but once again this time blew out his patellar tendon ending his 1993 season and perhaps his career. Determined to make a comeback Steve returned in 1994 almost a full year later, with his rehabilitation paying off. He played in 4 games, making a fumble recovery and 3 tackles, but unbeknown to most- Emtman had suffered a ruptured disc in his neck in his first game back heroically playing through the pain for the next 3 weeks. Steve finished his third season on the IR. In 1995, Steve signed with the Miami Dolphins where he started one game, making a sack, a fumble recovery and 10 tackles. 1996 would see Steve start the most games since 1993. He’d see action starting 4 contests making 2 sacks, 2 FF, and 33 tackles. The Redskins would sign him in 1997 where Steve would suit up for 3 games and make 4 tackles and retire after the season at the age of 27. Steve after football was inducted into the College Football Hall of Fame in 2006. 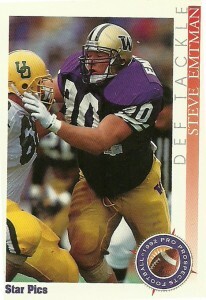 He also spent some time coaching defensive line with the AFL’s Spokane Shock and is a successful real estate developer. I sent off for Steve’s autograph courtesy of the Shock on his Action Packed Rookies card, but it appears that by the time my card had arrived, he was no longer coaching with the team. It has been well over a year now and thus logged as a failure.